Dust both sides of the fillet with garlic powder and season all, and place in the oven safe pan, then into the oven for 25 minutes. After it is cooked you can top your delicious fillets with shrimp scampi, or serve with a side dish of asparagus or green beans. You can even make a side salad for this dish. 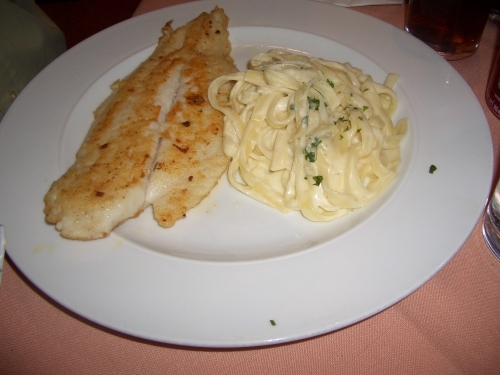 Tilapia is great for your health because of it’s lean protein and Omega 3 fatty acids. Tilapia has risen in popularity in recent years and is great because it is generally farm-raised, which means that it has had a controlled, vegetable diet, making it that much better for you! This sounds like a good recipe I may give a try. However, the photo doesn’t make me too excited to do so. It seems to lack color. “Presentation, presentation, presentation” is what my husband is always saying. lol… i agree with your comment, presentation is important and it lacks color and a little style!!! Maybe if it had a little greenery it will at least look better! !